Hello once again and thank you for checking out the RHDJapan blog. 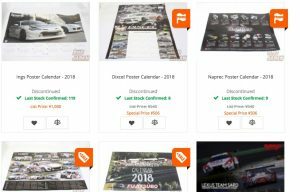 We have received the last available left over stock of these beautiful posters/calendars and for the remaining stock we will offer 2 per qualifying order! These items are NOT for sale, they can only to be included with processing orders in which the requested calendar(s) can be included with no additional shipping required. Use the Help Desk or Contact Form with order number and desired calendar SKU(s) to request.